Decisions surrounding planning and community design can have significant impacts on the physical, social and mental health of community members. Local leaders can influence health impacts when making decisions related to the general plan, zoning and conditional use permits, environmental review and health impact assessments. Cities and counties throughout California are demonstrating leadership in creating active, lively communities that support the health and vitality of their residents while also making their communities more sustainable. Community design influences residents’ mode choice, impacts the ability to be physically active, affects opportunities for social interaction, shapes the natural environment and informs personal food choices. Planners and land use officials can design environments that provide opportunities for physical activity and healthy eating. These resources can support and inform your efforts to include health in planning and community design decisions. Resources include guides, toolkits, fact sheets and links to other organizations. These case stories highlight examples of creating healthy neighborhoods by way of planning and community design. Each story includes lessons learned, links to additional resources and can serve as examples other agencies may consider and adapt to meet their communities’ unique circumstances. 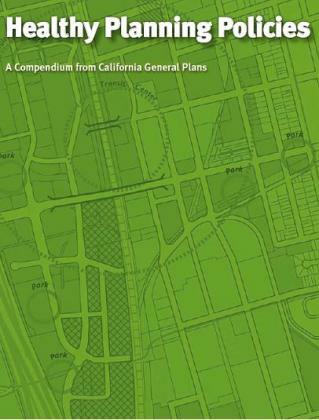 These guides provide a plain-language overview of planning concepts and issues in California and more.